I'm David, 39, to be 40 later in October, essentially the same age as the fourth Led Zeppelin album without an official name. Perhaps the rest of you might consider this the first time someone on the Autism Spectrum; Asperger's Syndrome, to be exact, has become a member of the official Led Zeppelin forum. I own two Ludwig drum kits; the Ludwig Classic Maple "Zep Set" in Natural Maple finish and the Ludwig Limited Edition Stainless Steel John Bonham Set, with my eye on purchasing a couple of other Ludwig drum kits down the road before I call drum kit purchasing quits. Also have an interest in upgrading the pair of Ludwig timpani I own to a 26" and 29" pair from their Professional Series line of timpani, with two Humes & Berg timpani trunk cases on caster wheels to go with them. Cymbalwise, I have Paiste 2002 and Paiste Giant Beat cymbals, one Paiste cup chime and Paiste Accent Cymbals, and a 30" Paiste Symphonic Gong. Yes, I do happen to do drum playing. My earliest memory of playing Led Zeppelin recordings was playing their fourth album, Houses Of The Holy, and tracks from Physical Graffiti. Wasn't even aware when I was almost nine that John Bonham had died. If he had lived, I am sure they would have steamrolled everything that was trotted out on Music Television in its inaugural decade. The drum playing I do is patterned after Bonzo. I feel someone like me has to stand in the gap, so to speak, almost 31 years after his passing, next to his son who also does drum playing. It wasn't until the late 1980s that I got into all of the other albums. That will do it for my introductory post. 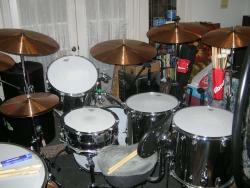 Like yourself, I am a Bonham fantic, I don't have his kit or sizes, but I can tune the kit to sound alot like his! Welcome Bonhamite. Enjoy your time browsing around and learning more of Led Zeppelin. There are some really informative threads and people here. my 10 yo son has aspergers. he's not into music very much. he loves to make little home movies on the laptop. he also loves the sims ( pc game ), playstation and tv shows like the simpsons and futurama. and atm he is getting into photography. Thank you very much for your welcome. I do know a lot about the band, and have read that ridiculous book "Hammer Of The Gods," and I believe my older brother has also. Speaking of my older brother, Keith, who predated me by eleven years, though not on the same month and day, his birthday was August 29th, mine was October 14th, he nearly attended one or both of their Oakland, California concerts in late July 1977. He had a high school friend who had tickets, but Mom told him we had to go on with relocating to near Houston, Texas from our home in Alamo, California. After the move, he had planned to go to their concert at the New Orleans, Louisiana Superdome, but then came the death of Robert Plant's son, Karac, so that put the kabosh on his plans. Sometimes I wish I had been old enough to understand the problems going on in the band at that time. Then again, I probably wouldn't have survived the era, with the awareness of Autism Spectrum Disorders back then being nothing to what it is now. Add to that the awareness of the dangers of drugs not being widespread either. There is a possibility I would have gotten institutionalized if I had been an adult in the Led Zeppelin era. I am happy to say that my parents and my older brother and sister didn't give up on me. By the way, I don't touch smoking or drinking. It is good to see another Texan, even one from California, on the forum. And I agree with you about the advancement of modern medicene, and society, concerning conditions of the brain. My son has ADHD and he might have very mild Asperger's. I am happy that his school is very knowledgable about him and that he is on safe meds. that just readjusts his brain chemistry but not his personality. He is who he is and I would never change him one bit. He is a happy child. Enough of me, why did you start to play the drums? Hey, I'm a Texan! Although, recently transplanted to Pittsburgh. Welcome Bonhamite! Glad you found your way here! To answer why I started to play the drums, I don't know what else to say except it's an instrument I have always enjoyed, on my seventh (1978) or eighth (1979) birthday I had gotten as a gift this Disney Rocktet toy trap drum set. 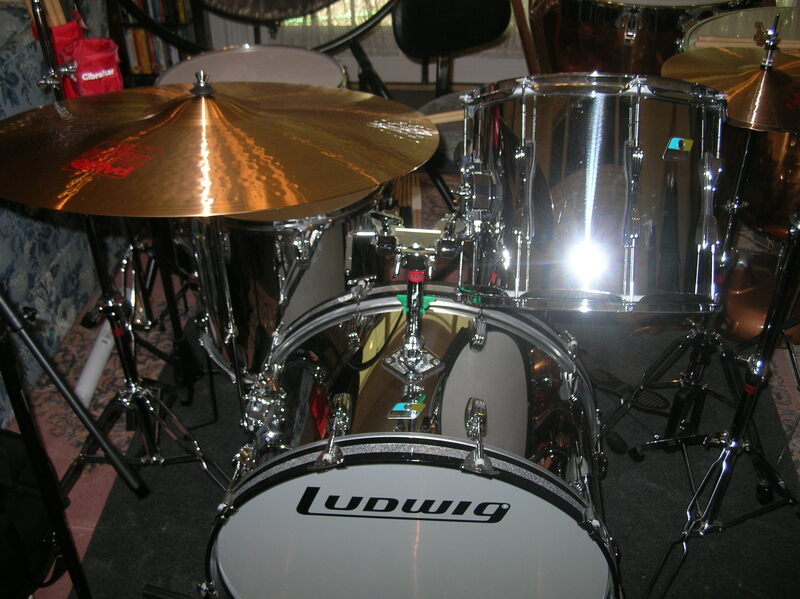 Had also taken lessons in the mid-1980s, in 1984 I had gotten my very first Ludwig set, it had been advertised on our local cable system by an area doctor, Piano Black in color, with Granittone on the insides of the toms and bass drum. The snare drum happened to be a 5" x 14" Ludwig Supraphonic I believe, the toms and bass drum sizes were 8" x 12", 9" x 13", 16" x 16", 14" x 22". Of course, I had sold that kit, replacing it with the kits I mentioned in my first post. 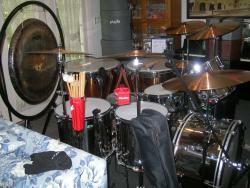 I certainly am sticking to playing John Bonham's drum sizes from hereafter. Perhaps sometime I will post photos of them. By the way, the two other Ludwig drum kits I have my eye on are the Ludwig Amber Vistalite "Zep Set" reissue kit with a matching 6.5" x 14" snare drum, and another Ludwig Classic Maple "Zep Set," this time around in Green Sparkle Wrap finish with the blue/olive Ludwig parallelogram badges that Ludwig offers as a custom option on their drums. 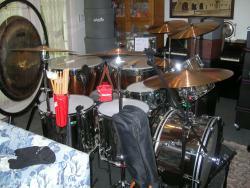 That kit would have a matching 8" x 14" Ludwig Classic Maple Snare Drum to go with it, also with the parallelogram badge. I thought I knew alot about the band, but found out that there is always something new to learn here. As well as making some good friends. Nice, another Libra, a positive person of balance and truth. My birthday is in Oct. also. I have a cousin who was diagnosed with Autisim. Unfortunatly, this was in the early sixties and there was no programs to deal with it. I lived with him and my uncle for almost a year and he was very low functioning but smart at the same time. I was 11 at the time and remembering being scared at first because I had never met anyone with this type of disorder, but soon found him to be a sweetheart even though he really did not interact with the family very well. Later I found out that my uncle had to instutionalize him as he could not give him the proper care as he got older. Welcome, I like your username. The untimely death of Robert's son cost us the Buffalo NY show as well and it was days before the event. Lines of disappointed fans who would never see them taking their tickests back for refunds . Back then it was Rich Stadium and it will always be Rich stadium to me. Summerfest used to be there where many big acts would play. I was fortunate to have gone out of my way to buy tickets for the Landover MD show on Monday May 30th 1977. Pure luck. I had never been to DC or MD. A guy looking for Elviis ticksts, as he was in Rochester around the same time, had a couple extras to scalp. He had tickets to Madison squre garden too but would not sell any of those. So I said I will take anything I can get. Had I known Buffalo was to be scheduled I may never have seen them. The Buffalo show was added. Back in the seventies I had to do a paper for extra credit in Psychology. It was on infantile autism. Not a very well known subject in those days. Good place to start for your son making home videos, I make home videos myself. I do video production myself, so making home movies on the laptop is a good place for your 10 year old son to start. I`m a new member to Led Zeppelin.com and i was browsing the topics and saw this post and had to reply. Nice kit. There also seems to be an ET collection in the cabinet. That's right, Steve, it is an E.T. The Extra-Terrestrial collection. A very favorite movie of mine. The stuffed toys are lovingly and collectively called The E.T. Family. I am fairly sure I have asperger's, too... and I have diagnosed sensory processing disorder as well... Welcome to the forum ! Are you still awake, Kathleen? I wonder if we can talk. Kathleen, may we become friends on Facebook? I've sent messages to you on there. 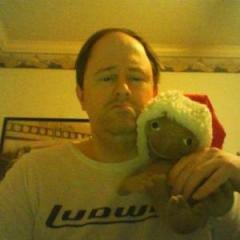 For some reason, I am not able to friend request you on there, you would have to send me one.